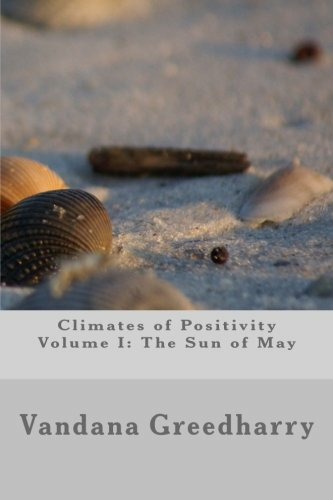 Climates of Positivity The trilogy revolves around Tina who is at a time of her life when she feels miserable and overwhelmed with her worries. She is almost on the brink of depression. In a desperate attempt to find peace within herself, she sets on a journey to an unknown destination, empty handed. Though unaware of it at the moment, she will be meeting three completely different persons who have already treaded on the same disturbing path. They will detail to her their life experiences; explain to her how self-help techniques, wellness guides, positive thoughts and attitudes affected their personal and work lives. The subsequent volumes will analyse the impact of positivity on some management theories. They will also deal extensively with self-help techniques and positivity in the work life. Tina will be deeply moved by their stories and will have a life-changing experience over the weekend. 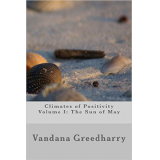 The Sun of May (Volume I) The Sun of May depicts the difficult and depressing experiences of Tina in her personal life as well as in her workplace. A combination of dreadful emotions plays havoc with her mind and heart. Following her heart’s bidding, Tina leaves for an unknown destination, almost empty handed, without any luggage to find inner peace. Her impromptu spree leads her to Loweswater where she inadvertently stumbles into Ray, a charming and mysterious stranger. She is invited to spend the evening with Ray and she accepts timidly. Tina and Ray bond quite easily and they ultimately have dinner together. Ray instinctively senses that Tina is going through a difficult phase and sheds his mysterious demeanour to unfold his life story to her. The atmosphere gets tense and electric as Tina is fully captivated with Ray’s story. She is literally dragged in Ray’s life and almost relives every single moment of his life. Amidst all the talk, Tina is surprised to learn that Ray was an investment manager and had successfully cured his depression in the course of his employment. He depicts the ghost he saw during his difficult times and the therapy which had helped him surmount the blues. He also tells Tina about the techniques which he used to set aside the negativity; negative thoughts and attitudes, from his life and ultimately succeed in his career. Tina is left feeling quite impressed as Ray finally finishes his exciting story. She gets a better grip on herself as she hears how Ray successfully dragged himself out of his depressive lapse unscathed. She earnestly thinks of applying the techniques he has described in her life to boost up her willpower, positivity and to get her motivated. She leaves with Ray, feeling insecure about the whole journey and wondering what will lie ahead. The Sun of May follows Tina and Ray in their difficult moments and seeks to portray their depressive symptoms and feelings humorously. In addition, the self-help, wellness and positivity techniques can help in reducing stress levels, increasing the flow of positive emotions within ourselves and also reduce depressing feelings which inherently lead to negative attitudes.